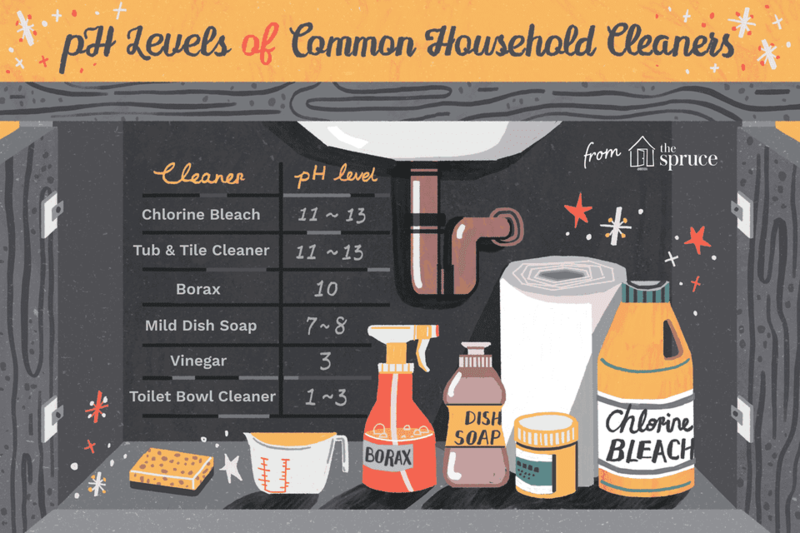 Chlorine bleach nearly tips the scale all the way to the top of the alkaline level. Because it's near one of the ends of the pH scale, we know it is corrosive and will require you to use proper ventilation when being used. Bleach is not safe to use on many surfaces including some fabrics. Do not mix bleach with other types of cleaning supplies or chemicals. 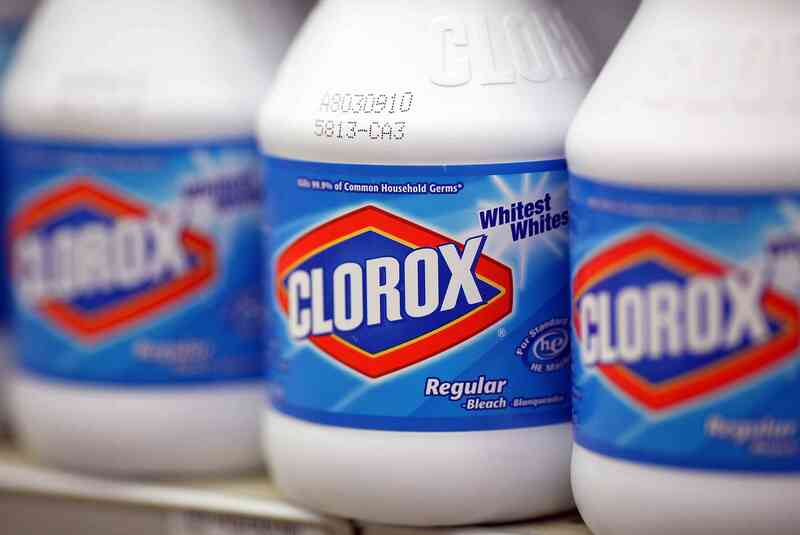 On the other hand, bleach is fantastic at whitening and removing stains. Ammonia is another highly alkaline substance with a pH around 12. Ammonia also can be corrosive and needs to be used in a highly ventilated area. Ammonia is not safe to be mixed with other ingredients. Harmful gasses will result. Ammonia can work wonders with tough dirt and grime, making it a formidable cleaner. Most oven cleaners are just as alkaline as ammonia giving them great power to cut through tough grease and grime. Of course, at the top of the alkaline scale, extreme care needs to be taken when using oven cleaner. Tub and tile cleaner is another alkaline substance that removes dirt and grime effectively but can be corrosive. Be sure to use caution and ventilate the room where you are using tub and tile cleaner. With a 10 on the pH scale, Borax is not as corrosive as some of its cousins like bleach and ammonia. But Borax is still an alkaline substance, good at breaking down oils and organic dirt. This is one of the reasons that Borax makes such an effective laundry booster. Baking soda is an alkaline substance, too. But just barely. Because baking soda has enough alkalinity to power through grease and dirt, but not enough to make it corrosive, it can be a great option to use in many places in your home. When it comes to neutrality mild dish soap usually hits the mark perfectly. If your dish soap is labeled mild, gentle, or great for hands, chances are its pH level is somewhere right around 7. This mildness makes dish soap perfect for day to day cleaning. Most surfaces won't be damaged by dish soap, and there are a lot of places it can be used besides in the kitchen sink. Most stone cleaners are usually around a 7 for their pH level as well. Since stone surfaces can be damaged by pHs that are too alkaline or too acidic, manufacturers usually produce a neutral pH. Be careful, though. Some stone cleaners can have pHs all the way up to 10. And on the other end of the pH scale, we have vinegar. Vinegar is acidic which makes it great for removing mineral deposits but also makes it possible for it to damage some surfaces, including stone. Many people mistakenly believe that vinegar is a perfect all-purpose cleaner, but surfaces that can be damaged by acids are not good candidates to be cleaned with vinegar. Lemons, like vinegar, are very acidic. And while there are many surfaces like copper pots and drains who benefit from the acidic cleaning and fresh lemony smell, there are others that can be damaged. Take care with using lemons on stone surfaces or near grout. Toilet bowl cleaner is another acidic cleaner that helps break down and remove mineral and other non-organic substances. Because of its acidic level, caution and ventilation will be needed. Some toilet cleaners can have a pH that is very close to 0. Because they are at the end of the pH scale, use extreme care when using.